The 2019–20 UEFA Champions League will be the 65th season of Europe's premier club football tournament organised by UEFA, and the 28th season since it was renamed from the European Champion Clubs' Cup to the UEFA Champions League. 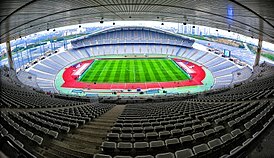 The final will be played at the Atatürk Olympic Stadium in Istanbul, Turkey. The winners of the 2019–20 UEFA Champions League will earn the right to play against the winners of the 2019–20 UEFA Europa League in the 2020 UEFA Super Cup. They will also automatically qualify for the 2020–21 UEFA Champions League group stage, and if they have already qualified through their league performance, the berth reserved will be given to the champions of the 11th-ranked association according to next season's access list. ↑ "Istanbul to host 2020 UEFA Champions League Final". UEFA.com. Union of European Football Associations. 24 May 2018. Retrieved 24 May 2018. This page was last changed on 21 July 2018, at 06:25.